Kick off your visit on the 28th (Thu): explore the stunning scenery at Inner Canyon, then take in breathtaking views at Grand Canyon South Rim, then examine the collection at Kolb Studio, and finally take some stellar pictures from Lookout Studio. Get ready for a full day of sightseeing on the next day: admire the striking features of Grand Canyon Railway Depot, then take in breathtaking views at Yavapai Point, and then tour the pleasant surroundings at Rim Trail. For where to stay, other places to visit, and more tourist information, use the Grand Canyon National Park online vacation builder . Los Angeles to Grand Canyon National Park is an approximately 7.5-hour car ride. You can also do a combination of flight and bus; or do a combination of flight and shuttle. The time zone changes from Pacific Standard Time to Mountain Standard Time, which is usually a 1 hour difference. Plan for much colder temperatures traveling from Los Angeles in February, with highs in Grand Canyon National Park at 49°F and lows at 18°F. Finish your sightseeing early on the 2nd (Sat) to allow enough time to travel to San Diego. Kick off your visit on the 2nd (Sat): take in the waterfront at Seaport Village. On the 3rd (Sun), you'll have a packed day of sightseeing: pause for some photo ops at Mt. Soledad National Veterans Memorial, then stroll the grounds of Fort Rosecrans Cemetery, and then explore the striking landscape at Point Loma. To find photos, maps, ratings, and more tourist information, read San Diego online vacation planner . You can do a combination of bus and flight from Grand Canyon National Park to San Diego in 8 hours. Alternatively, you can drive; or do a combination of bus, taxi, and flight. Traveling from Grand Canyon National Park to San Diego, you'll gain 1 hour due to the time zone difference. When traveling from Grand Canyon National Park in March, plan for a bit warmer days in San Diego, with highs around 69°F, while nights are much hotter with lows around 56°F. Finish your sightseeing early on the 4th (Mon) to allow enough time to drive to Los Angeles. You'll explore the less-touristy side of things at Camarillo Premium Outlets and The Huntington Library, Art Collections and Botanical Gardens. 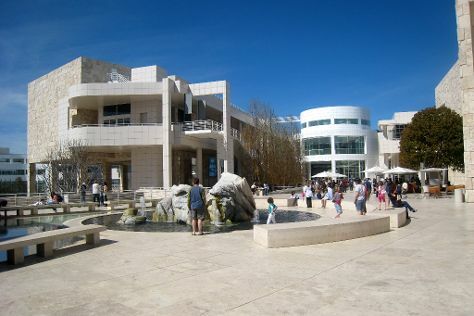 Your cultural itinerary includes sights like The Getty Center and Santa Monica Pier. Get out of town with these interesting Los Angeles side-trips: Tehachapi Mountain Park (in Tehachapi) and Disneyland Park (in Anaheim). There's still lots to do: enjoy the sand and surf at Venice Beach and Boardwalk, appreciate the extensive heritage of Venice Canals Walkway, learn more about the world around you at La Brea Tar Pits and Museum, and admire the majestic nature at El Pueblo de Los Angeles. To see reviews, traveler tips, more things to do, and more tourist information, read our Los Angeles vacation site . Getting from San Diego to Los Angeles by car takes about 2.5 hours. Other options: take a bus; or fly. March in Los Angeles sees daily highs of 74°F and lows of 54°F at night. Wrap up your sightseeing on the 8th (Fri) early enough to travel to San Francisco. On the 9th (Sat), get curious at California Academy of Sciences and then kick back and relax at San Gregorio State Beach. On the 10th (Sun), you'll have a packed day of sightseeing: take a stroll through Union Square, then see the interesting displays at Cable Car Museum, and then browse the different shops at Ferry Building Marketplace. To see traveler tips, other places to visit, and more tourist information, read our San Francisco route maker app . You can do a combination of train and flight from Los Angeles to San Francisco in 4.5 hours. Alternatively, you can do a combination of train, flight, and subway; or drive. While traveling from Los Angeles, expect little chillier days and about the same nights in San Francisco, ranging from highs of 65°F to lows of 50°F. Cap off your sightseeing on the 10th (Sun) early enough to travel back home.